11 Bedroom Detached House For Sale in St. Agnes for Guide Price £1,000,000. This is a unique property and life changing opportunity ! There is a modern 3 bedroom family home attached to 3 further bungalows. This gives scope for holiday letting, multi family use or a host of business potential. Located close to the North Coast between St Agnes and Perranporth. This property is one of Cornwall's unique and individual homes offered to the market. The arrangement of property has evolved over a number of years and offers a variety of options from a large family home, multi family living to holiday letting or to run a bespoke business if required. The main property is arranged over two floors and presented to a very high standard with a superb kitchen/breakfast room, large sitting room, plus three bedrooms including a spacious master bedroom with en-suite. In addition to the main property are three further bungalow style properties each with a kitchen, sitting room and a total of eight bedrooms some having the benefit of en-suite facilities. One unique factor is that all the properties are linked together so could be used as one or individually. There are also large gardens ideal for the family or guest to use plus a further paddock. There is also plenty of parking plus a double garage. A spacious hall positioned in the centre of the property has a rising turning staircase to the first floor and a separate cloak wc. From the hall you enter a large bright family sitting room running the full depth of the property with patio doors to the rear courtyard. There are also French doors which lead through to the separate dining room which in turn has double doors opening onto a superb spacious fitted kitchen/breakfast room. Fitted with a luxury range of modern style units and matching central island with inlaid sink to a black granite work surface which also creates a breakfast bar. A large range style electric oven and integrated appliances complete the kitchen, yet there is plenty of space for seating or a breakfast table. To the first floor is a galleried landing area giving access to the family bathroom, fitted in a modern style with a separate shower and bath. There are two further double bedrooms and a very large master bedroom which also has a dressing room and en-suite fitted with a separate shower and bath. This bungalow is attached to the main property and could easily become an annex if required. It also has its own entrance. The property consists of three bedrooms, family bathroom, separate wc , modern fitted kitchen and a spacious sitting room with feature fire place and patio doors to the garden. This property has its own entrance and offers two double bedrooms, spacious sitting/dining room, utility room and a modern fitted kitchen. There is also a separate bathroom and a further shower room. This bungalow is attached to both Bungalow 1&2 so can be used as one large property. This property has its own entrance from the courtyard area taking you into the large sitting/dining room. There are also three double bedrooms each having the benefit of en-suite shower rooms. Also in this bungalow is a modern style kitchen/breakfast room, perfect for a holiday let or annex. To the front of the property are walled gardens with a gate entrance to the main property and double gates to a gravelled parking area which also leads to the entrance to bungalow 1. Moving round to the left side of the properties are the expansive gardens with large lawn areas edged with trees, shrubs and flower beds. This garden also captures the sun perfectly for family barbeques or staying guests to enjoy. Moving further round towards the rear is a large rectangular grass paddock with fencing to the boundaries. This can offer many uses ideal for children or a play area or the potential for ponies. A paved pathway gives access around the rear of bungalows 2&3 past a side gravelled area to a block paved courtyard ideal for additional parking. To the side of the main property is a driveway which provides access to the courtyard and a detached double garage. The total plot is approximately 1.1 acres. The properties have mains electricity (separately metered) and water. There are four separate oil fired boilers and oil tanks for each property (each controlled separately). The private drainage is shared by two septic tanks. 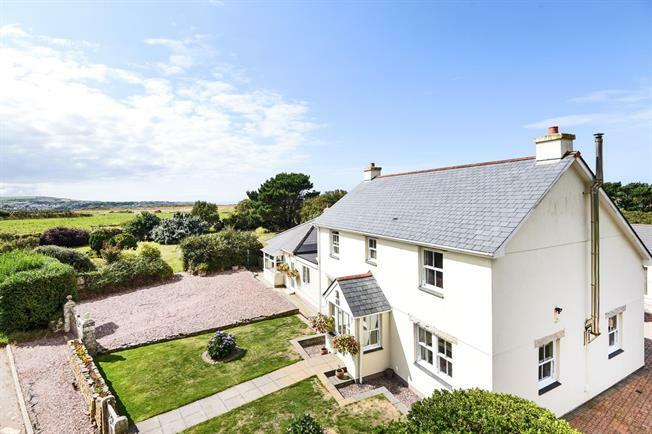 The small hamlet of Trevellas is situated a short distance between the popular North Cornish coastal villages of St Agnes and Perranporth both very popular holiday destinations. They both have an array of amenities to include public houses, restaurants, shops, and schools. Both have their own popular surfing beaches and many stunning coastal walks. From the property is a short walk to the rustic Trevellas Cove. Also along the North Coast are the popular beaches of Holywell Bay, Crantock and Fistral beach at Newquay. The cathedral city of Truro is approximately nine miles away.